This podcast, a 15-minute experience of silence and stillness before the Lord, is our Christmas gift to you, our way of saying “thank you” for being one of our faithful podcast listeners. For the fuller experience with Jesus, please find the video titled "Breathe: Being with God in Silence" on our YouTube page. Advent is a low point spiritually for most Christian leaders. We are told that told Christmas is the time to get as many people as possible to the church, to close the financial year strong, to thank all our leaders, and to model reaching out to our neighbors for Christ. The problem is that in the process we lose the wonder and beauty of celebrating God’s coming in Jesus of Nazareth. This podcast talks about the top 4 Christmas killers and what we can do to resist them. God’s ways are little and slow, i.e. they are a mustard seed. Mustard seeds appear insignificant, powerless, imperceptible, and defeated. Few of us signed up to lead in this way. I surely did not! Yet Jesus pleads with us to resist the big, powerful, and sensational ways of the world and embrace his way. This podcast returns to Matthew 4:1-11, looking at Jesus as our model of embracing his limits in order to stay rooted in the Father’s love and seemingly “ineffective” timetable. What are ways in which Satan tries to split you off/separate you away from the Father in your pastoring/leading? Saying no to leadership opportunities, and the increased impact and influence they can afford, is not a topic talked about very often today. For that we need to look at the work of the Holy Spirit in the history of the church. In Part 2 of this series, Pete looks at two towering figures in particular: Bernard of Clairvaux and Gregory of Nazianzus. As people who lead in the name of Jesus, we are not to enter every open door or seize every new opportunity. Why? Doing so outside of God’s timetable damages both ourselves and his long-term kingdom mission in the world. In this podcast Pete talks about three reasons we ought to consider pausing to pray before saying yes to new leadership opportunities before us. 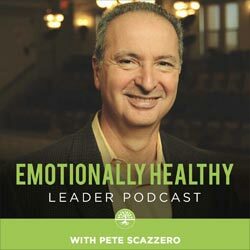 Pete offers highlights from the eight charts that formed the basis of his book, The Emotionally Healthy Leader, contrasting the standard practice of how we typically do leadership vs. an emotionally healthy way, and talks about his new free e-book: Why Leadership Matters for a Discipleship that Deeply Changes Lives. Pete explores the story (with its present-day applications) of God directing Elijah to go to a desert for silence and solitude. In this podcast you will hear a message on God’s invitation - at every stage of our life and leadership - to grasp ever more deeply that we are his “beloved,” i.e. we are deeply loved by him. Getting this truth frees us from the demonic voices that tempt us to get our loveability from other sources and fills us with the courage we need to do God’s will regardless of where it leads. In part 2 of this series, Pete talks about 4 additional gifts/applications from the Desert Fathers and Mothers that offer a challenge to us in leadership today. At the end of the third century Christian men and women began to flee the cities and villages of the Nile Delta in Egypt to seek God in the desert. In this podcast, Pete talks about what he believes is their contribution and gift for us today – both in our leadership and in our discipling of others. Living with integrity, whether you're in your twenties or seventies, is no small task. In this podcast, Pete lays the foundation for a leader’s integrity by discussing four critical areas: integrity with God, integrity with yourself, integrity in your marriage / singleness, integrity in your leadership. The first crisis the early church confronted was a crisis of integrity. Pete speaks on the story of Ananias and Sapphira in Acts 5:1-11 and shares why integrity is so important to leadership. Pete shares 10 questions that became an anchor for him during a two-year period that served as a crucible of differentiation in his life. In part 2 of this podcast series on Becoming a More Differentiated Leader, Pete talks about four practical truths that can help us make the radical transition of dismantling our false self in order to lead faithfully out of our true self in Christ. Pete introduces the paradigm-shifting concept of differentiation as one significant reason why exercising excellent leadership is so hard and addresses three key questions can help us grow in differentiation and maturely navigate high-charged situations. To live and lead like Jesus requires that we embrace the fact that we are people with deep weaknesses and vulnerabilities. At the same time, it also requires we embrace the glorious truth that we are incredible – with unique passions, histories, gifts, experiences, sufferings, and destinies. Our human hearts desperately crave praise, notice, and honor (usually from the wrong places). But actually, we were made to be noticed and honored by God as the primary aim of our lives. In this podcast, Pete completes a 2-part study on the radical contrast of the world’s easy-to-follow discipleship to Jesus’ hard-to-follow discipleship. In part 1 of this podcast series, Pete shares 19-months worth of learnings on the theme of discipleship in the Gospel of Matthew and makes specific applications for leaders today. Keeping Sabbath is a core spiritual practice – an essential means God uses to slow us down and mature us. In this podcast, Pete expounds on ten core reasons Sabbath is indispensable for those who lead in Jesus’ name. God has a great plan for you. But if you are going to become the extraordinary human being He intends and be a blessing to the world, you will have to navigate the dark nights that will come your way. Discerning what season you, and your ministry, are in right now is one of our most important leadership tasks. In this podcast Pete expounds on the seasons of Fall (transitions), Winter (death), Spring (fruitfulness), and Summer (abundance), examining how each holds its own gift from God – if we cooperate with it. In part 2 of this series, we will look at the journey of Job as a model of a leader who integrated his sadness, anger, and depression in ways that made him an even greater leader who continues to speak to us today. In this podcast, Pete explores David’s integration of great leadership with great grieving and why this is so critical for us today. Limits are often the last place we look for God. The problem is that when we fail to look for God in our limits, we often bypass him. In this podcast, Pete considers Adam and Eve in the Garden, Jesus being tempted by Satan in the desert, and David at the height of his power and influence. One of the greatest spiritual challenges for leaders revolves around how we frame and respond to the limits God places around us. In this podcast, Pete begins offering a biblical framework to understand limits as gifts of grace from the hand of God and answers three of the most common questions he hears. In part 2 of this podcast, Pete issues an invitation to get deeply anchored in God by deliberately structuring your life in ancient spiritual practices that have stood the test of time. Most leaders are starved for time. Few of us have a sustainable, long-term plan that answers the question: How can I live and lead in a way that is calm, relaxed, and filled with contentment in Jesus? In part one of this podcast, Pete discusses how to deliberately structure our lives around God’s rhythms. In Part 2 of this podcast, Pete offers three different examples of how to redefine success in ways that look beyond numbers. He then looks closely at the three factors necessary to internalize the kind of radical change necessary to make the doing of God’s will, regardless of where it leads, the measure of our success.